Each species of bird is wonderfully unique in its own way but there are some general guidelines that apply to them all. This chart will cover the general guidelines. Below you will find some unique traits that apply to specific species. Generally, larger parrots are harder to care for than smaller birds. Birds are warm-blooded vertebrate animals that have wings, feathers, a beak, strong, hollow bones and no teeth. Most have powerful flight muscles. Choosing a bird as your pet can be very rewarding. Owning a pet bird can be a wonderful experience but birds are not the best pet for everyone. There are many different types of birds to choose from. It is very important to choose the right bird to fit into your lifestyle. Hand-raised babies make the best pets. Birds are intelligent, entertaining and active. Some are playful and affectionate. They will not be happy if placed in a secluded part of the house and ignored. Toys should be provided for entertainment. Select your toys with the bird’s safety in mind. Beware of toys with small parts that can come apart. Many different bird toys can be found at your local pet store. Toys should be rotated to keep the bird stimulated. Pressing seeds inside an orange or an apple can be entertaining and challenging for a bird. A bored bird is an unhappy bird. When deprived of attention or environmental stimulation they often become destructive to their surroundings and sometimes even to themselves. Most birds chew anything they can get their beaks on. This is a natural, healthy exercise for the bird. For this reason it is important to keep the house clear of dangerous items when your bird is flying free. Avoid anything made of lead such as stained glass, fishing weights, metal toys and even jewelry. Hide all electric cords and avoid poisonous houseplants. Some types of birds will overeat and chew excessively when they are not properly stimulated. Some can be trained to do simple tricks and to talk. Most birds have pleasant voices when talking or singing, but can quickly become loud and obnoxious when jealous or angry. Some types of birds are more demanding than others. Some are affectionate and will enjoy being held while others will prefer not to be. When trying to get your bird to perch on your hand, do not misunderstand an open beak aimed at your hand as an attempt to bite you. Birds almost always "test" a perch before stepping onto it, and will often touch its beak to your hand before stepping onto it. Be sure to research the different types of birds to find the one that fits into your lifestyle. Varies greatly depending on the type of bird you choose. Anywhere from 4-36 inches (10-92 cm). Pet birds are housed in bird cages or aviaries, however it is very cruel to lock the bird up all day long. They are very intelligent and need to be let out daily. This is particularly true with larger parrots. While some types of smaller birds are less demanding of time outside the cage, it is imperative for most of the larger types to be let out several times daily. The largest cage or aviary that can be accommodated in the home should be provided. It should be wider than it is tall to allow the bird to easily stretch out its wings; ample height should be provided for long-tailed birds. The minimum width should be twice the bird's wingspan when wings are fully extended. Large parrots do best in large aviaries as opposed to cages. Be sure the bird cannot slip his head between the bars of the cage. The cage should be non-toxic and easy to clean. It should be strong enough to resist bending or dismantling by the bird. Cages should be placed at human eye level in a well-lit part of the home where there is lots of family activity. Natural sunlight is desirable but the bird should always have access to shade. Cage liners such as newspapers, paper bags or paper towels can be placed inside the cage for easier clean-up. Some use kitty litter, walnut shell, chopped corn cobs, wood chips or sand, however these are not preferred as they can promote growth of mold and fungus and can make it difficult to monitor the bird’s droppings. Whatever you choose to use should be placed under a wire barrier so the bird does not have direct access to it. At least one perch should be provided inside the cage. Some types of birds prefer more than one perch. The perch should be placed high enough that the bird’s tail does not hang down into its food for water or touch the floor of the cage. Food or water should not be placed directly below the perch as bird droppings will contaminate them. Generally, pet birds can tolerate temperatures that are comfortable to humans. Sudden changes in temperature may be a potential threat to the bird. Pet birds can adapt to a wide range of humidity levels. Birds that are native to subtropical climates may need increased humidity levels such as running hot water in the bathroom or frequent spraying of the feathers with a water bottle. Birds can be quite messy. Food and water bowls should be cleaned daily. A thorough cleaning of the cage should be done at least once a week. When outside of the cage they will for the most part, poop at any time. Be prepared to clean up the bird’s droppings. Sometimes this can cause damage to things inside your house, however this is one of the factors about having a bird that you must accept before deciding on this type of pet. Birds also like to chew and should be watched carefully when outside of their cages. Do not use any product other than plain water to bathe your bird. Frequent bathing can help remove oil buildup from petting and handling. Trimming a bird’s wings prevents the bird from being able to fly around nonstop, however, even a fully clipped bird can fly in the right conditions. Wings can be trimmed by your avian vet or can be done at home. It is best to have your vet show you how this is to be done. Never cut new feathers still in their sheath (blood feathers if cut, will bleed). If you accidentally cut a blood feather, you must grasp the wing and pull the feather out at the base to stop the bleeding. Cutting feathers of both wings will allow the bird to flutter to the ground but not maintain flight. After you have trimmed your bird’s wings, hold him close to the ground and let him gradually discover he cannot fly. Nails should be trimmed frequently. If a nail is sharp or is starting to curve past the plane of the toe you know it is time for a trim. Using an emery board on a daily basis can be sufficient. Styptic powder should always be on hand in case you trim the nail too close to the quick. Placing styptic powder on a nail will stop the bleeding. Sandpaper perches can cause serious foot problems, including chronic ulcerated sores, and do little in regards of wearing down the nails. 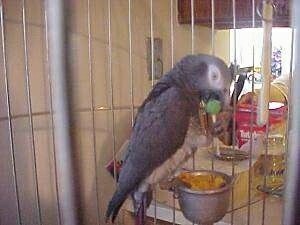 If you provide sufficient things for your bird to chew on, in most cases it will keep its beak trimmed on its own. Some chewable items that can be provided are soft white pine, pine cones, sugar cane, tree branches, lava rock, mineral blocks, natural fiber rope, chew bars, rib or steak bones, cuttle bone, rawhide dog chews, hard biscuits and nuts. Manzanita, madrona and eucalyptus are all safe woods for birds to chew. They should be rinsed with water before giving them to the bird. Some flaking and shelving of the beak is normal, however excessive flaking, shelving or overgrowth may be a sign of a sickness. Birds with overgrown tips or cracks may need smoothing. Since the beak has a blood and nerve supply take caution in how much, if any, should be trimmed. Your bird should have the opportunity to bathe daily. Leaving a bath bowl on the bottom of the cage or by gently misting the bird with a water bottle are two ways you can give your bird a bath. Baths should be given in the early part of the day so the bird is dry by bedtime. Frequent bathing stimulates normal preening behavior. Preening is when a bird runs its feathers through its beak from the base to the tip to straighten and clean them. Some birds have oil glands at the base of their tails. They take some of these oils and spread them out along their feathers, creating a "sheen" which protects and repels water instead of absorbing it. Birds are often seen preening one another. They may also attempt to "preen" their human’s hair. Preening should not be confused with plucking or feather biting. When a bird feather-bites, it will bite its feathers, snipping them off at the base, close to the skin or directly at the feather follicle. A plucking bird will pull and pluck the feathers out completely. Plucked feathers grow back quicker than those feathers that have been cut off at the base. Regular bathing has been known to cure feather-plucking in some birds. Bathing not only keeps the bird clean but it also controls the bird's dander, applies essential moisture to the feathers and softens the new pin feathers. A bird’s diet is one of the most important aspects to keeping a healthy bird. Birds require a nutritionally balanced diet for a long and healthy life. Food should be placed in a wide bowl as opposed to a deep cup. Spreading out the food allows the bird to see it better, encouraging them to eat a wider variety. Since birds’ diets vary greatly from one species to another, research what types of foods are recommended for the type of bird you own. A good overall rule is no more than 50% of a bird’s diet should be seeds and nuts. Depending on your type of bird, some examples of other foods commonly fed to birds are a variety of other people foods such as leafy greens, fruits, vegetables, spaghetti, yogurt, lean cooked meats such as chicken, small amounts of cheese and boiled eggs. If a food is not healthy for humans, it will not be healthy for your bird. A powdered vitamin supplement can be added. A bird fed only seeds and nuts will be unhealthy. If you find your bird is only eating seeds and nuts and not the other foods you are offering him, try only offering seeds and nuts for an hour a day and leaving the other foods out the rest of the day. If your bird is hungry, he will try the other foods. Fresh water should be provided at all times. Water should be changed daily. Be sure to research what types of foods are best for your species of bird. Birds should be allowed out of their cages to fly around the house or to crawl around the outside of their cage. When allowing your bird out of its cage make sure all windows are closed. Screens are essential for windows and doors. Decals or curtains should be placed on windows to avoid the bird crashing into them. Keep all ceiling fans off while your bird is out. Avoid cooking on the stove or oven while your bird is out. Birds can drown in small amounts of water. Take caution with tall skinny glasses of liquids, or hot liquids such as a cup of tea. Toilet lids should be kept closed. Most birds like to play in water but water play should be supervised. Many even enjoy showers with their owners. 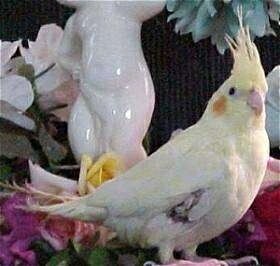 Avoid hair spray and bath perfumes around your bird. Always stay close by when your bird is out of its cage. Anywhere from 8-80 + years depending on the species of bird. Be sure the bird you choose is a healthy one. A sick bird is no bargain no matter the price. In most cases by the time a birds shows symptoms of sickness the illness is quite advanced. Do not choose birds that make clicking sounds when they breathe or whose tails bob with each breath. A bird that appears tired, ruffled or droopy, or that hides his head under his wing is a sure sign of an unhealthy bird. Avoid birds that are sneezing, sitting on the bottom of the cage or that have discharge above the nostrils. Droppings stuck to a bird’s tail feathers is not a good sign of a healthy bird. A healthy bird will have lots of energy and will eat often. It will be bright-eyed with clean, shiny feathers. Birds should be taken to an avian veterinarian at least once a year for a wellness check-up and immediately after it is purchased for a good overall physical and anytime your bird shows any signs of sickness. Take caution when introducing new birds to the birds you already own. Many birds harbor contagious disease-causing organisms. Placing these new birds in an isolated room for a period of time is recommended. Keep in mind that birds are exquisitely sensitive to toxins, especially those in the air they breathe. Things that smell strong to humans can often kill birds. Special Traits: Affectionate, but can be shy. 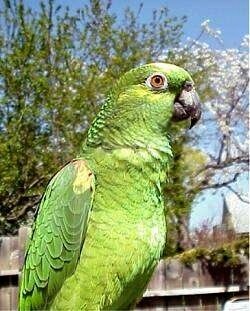 Excellent talker, known to be the best parrot at mimicry, although some individuals may not speak. Not colorful, prone to self-destructive behavior such as feather-plucking when bored. This behavior may be due to the bird’s intelligence. Greys have been known to understand and use human language. Relatively quiet compared to other birds. Tends to bond to one person. Can be very temperamental and are known to be nippy. Capable of loud calls. Sexing: Males are usually about 1 inch larger than females. Males have larger, flatter, broader heads, while females have a more slender neck and a smaller, rounded head. Males’ eyes are more round than the females. Females’ eyes are more egg-shaped. Male Congo African Gray Parrot usually is darker on the wings and has red feathers around the vent. The vent is the area just in front of the tail on the underside of the bird. Special Traits: Excellent talker, very affectionate, but few enjoy petting. Clear voices and learn new words easily. Good at singing, laughing and whistling. Can become very tame, and enjoy human company. Can be aggressive during breeding season. Some male Amazons can be difficult after they reach sexual maturity. Good early training is required to prevent the male Amazons from becoming too mean. Some Amazons are known to be noisy, while other types are reported to be quieter. Special Traits: Good first bird, easily tamed, limited ability to talk. A few can be taught to talk, but not all will. Hand-raised birds are more likely to speak. Quiet compared to other birds, but can still get loud. Not one-person birds, they will interact with the whole family. Excellent whistlers and sometimes will mimic speech and sounds. 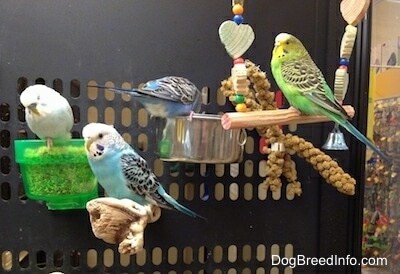 Sexing: Females have brownish cere, males are deep blue. (Cere is the colored area above the bird's beak where its nostrils are.) 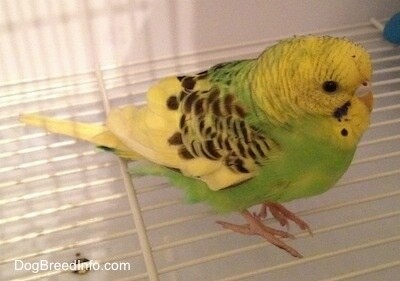 Note: color only appears after the bird is about 6 months old. Special Traits: Playful, highly intelligent, curious, energetic and love people. Can get silly, enjoy hanging, tumbling climbing and rolling. These busy little birds need lots of toys to help focus their energy. Don't tend to be one-person birds. If hand fed as babies they tend to like everyone. Gentle nurturing dominance should be practiced with these birds, because if left to their own devices, caiques can become pushy, dominant and aggressive. They should be provided with plenty of chewable toys to keep their strong beaks busy. If they are not kept with another bird they will be quieter. Have a shrill call, but tend to only be as loud as the environment around them. Special Traits: Good first bird, easily tamed, limited ability to talk, but can sometimes be trained to mimic whistles and short phrases. Males are more likely to become talkers and whistlers, and are more independent than females. Females tend to be quieter, more affectionate and often are more acrobatic. Gentle and docile, and have a friendly personality. Quiet compared to other birds, but can still get loud. 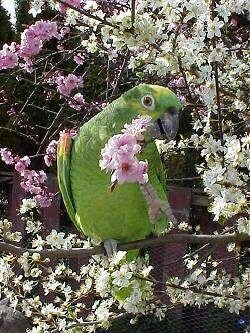 Good for children and working owners as they require less time than some of the other larger parrots. Sexing: Males tend to be more colorful than females. Special Traits: Limited talking ability, but most can learn to talk, very affectionate, friendly and intelligent, self-destructive if neglected, may learn to scream at owners for attention. Larger cockatoos are harder to care for and require more time than smaller types. Some owners have reported their large cockatoos do not like small children. They cannot be left and ignored; they need a lot of daily human attention and a lot of time outside of their cages. Cockatoos naturally produce a lot of feather dust or powder down from their feathers. Sexing: Generally, males have darker eyes than females. Special Traits: Entertaining, playful with a great personality, funny little characters. Easily trained. Can be trained to talk. Hand-raised and fed birds are more likely sweeter and more affectionate, also easier to train. Tendency to be very loud. Can be protective of their loved ones. Sexing: Hard to tell by appearance, however in the male Blue Crown Conure, the feathers cere are slightly longer. (The cere is the colored area above the bird's beak where its nostrils are.) Also, the males have larger white eye patches. Special Traits: Quiet compared to other birds, but will match the noise level around them; will scream if the noise around them is too loud. Can be trained to talk. Does a good job of imitating humans. Hand-raised Eclectus will have much better temperaments. Love food, younger birds may get upset if you put off their meal for too long. 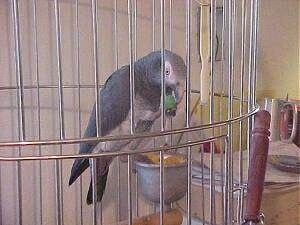 Sexing: Males are green with a yellowish beak; females are a red with a black beak. The underside of the male's wing is bright red with a small patch of blue. Special Traits: When one spends a lot of time with this bird they can be taught to do tricks, are great mimickers, sweet, curious, social, fearless, extremely intelligent, energetic, and very playful. Not very loud compared to some other birds, but can become loud if they want to get your attention or if they become over-excited. Special Traits: Sociable, excellent talker, very affectionate, outgoing and playful. Clear voices and learn new words easily. Good at singing, laughing and whistling. Can become very tame, and enjoy human company. Can be very high-strung. Loud, harsh call, known to sound like a seagull. Special Traits: Excellent talkers; have been known to learn about 250 words when one spends the time teaching. Very intelligent. Can learn tricks fairly quickly. Not necessarily affectionate, but when one spends a lot of time with this bird they can be very friendly and playful. Love to climb. Energetic and love to chew. Very social; have a pleasant nature but will develop a screaming habit if teased. When alarmed or excited its voice can reach a high-pitched shriek, which can sound like a car alarm. Needs large cage because of long tail. Sexing: Adult male has a black Ringneck with a slightly pink shadow and a manly flat big head size. Females do not have this prominent ring but may have a very light grey ring on the neck. Special Traits: Great talkers, stable temperaments, however some have strong reactions to stress. Charming and goofy. Not known to be loud, do not generally scream, but rather make low-key whistles, chirps, squeaks and assorted chattering. Should be handled by lots of people to avoid them becoming one-person birds. Special Traits: Colorful, can be trained to talk. High shrill call, and may call often, but are relatively not loud. Very playful, physical, love to be scratched, wrestled with and enjoy playing with many toys. If socialized while young, can be very affectionate. Need large cage to contain their energy. Specialized diet produces liquid droppings which can be messy. Special Traits: Very active, curious, playful and feisty. Not known for talking, however there are exceptions. High shrill call, and may call often. If socialized while young, can be very affectionate. May fight if kept in pairs. Can be taught tricks. Very cuddly birds, however their intense personalities can make them prone to nipping, territorial aggressiveness and jealousy. Hand-raised babies make the best pets. Special Traits: Large, requires a lot of space, very intelligent, colorful, loud, bold and impatient. Limited talking ability, but can learn to say some words and phrases and will learn to use them appropriately. Love to play in water and love toys. These highly intelligent birds must have a lot of daily attention or will become bored, distressed, anti-social and destructive. Some types of macaws are quite demanding and have a tendency to become aggressive or pluck. Special Traits: Very pretty bird. Sweet, not shy. Are not known as the best talkers, however can learn to mimic some sounds, words and phrases if you spend a lot of time with them. Not known to be loud, do not generally scream, but rather make low-key whistles, chirps, squeaks, and assorted chattering. Generally not a one-person bird. Likes people. Good for a house with kids, unlikely to bite, calm by nature. Love to chew. Special Traits: Can learn to talk. Cute little voices, which are not too loud. Will chirp, but does not scream. Can be very affectionate. Fearless and mischievous, may try to aggravate other animals. Must be handled regularly to avoid them becoming aggressive. Special Traits: Can be a good first bird. Generally quiet and less active than most other birds, although some have been known to scream. Some types of Pionus if not entertained spend a lot of time eating and may get fat. Can learn simple tricks. Generally are not known for their talking abilities, however some can learn 10-20 words or so. Like people and don't tend to be one-person birds. If hand-fed as babies they will tend to everyone. Life Expectancy: average of 25 years. Some have been known to live up to 40 years. Special Traits: Entertaining, playful with a great personality, funny little characters. Can mimic voices and can whistle. Thought to be one of the best talkers of the smaller parrots. Easily trained. Friendly, but tends to bond with one person when kept by themselves and may become protective of the person they bond with. Can be boisterous and mischievous. Hand-raised and fed birds are more likely sweeter and more affectionate also easier to train. Can be quite noisy. Special Traits: Can learn to talk but sometimes their voices are not as clear as other birds. Not known to be loud, do not generally scream, but rather make low-key whistles, chirps, squeaks, and assorted chattering. Playful and enjoy being held. Should be held by a variety of people to avoid them becoming one-person birds. Intelligent, and can be nippy and aloof if they don't get their way; hand-feds are calmer. Special Traits: Intelligent and highly social. Inquisitive, curious, playful, and clownish. Emotional, affectionate and friendly. Needs lots of toys. Are not known as the best talkers, however can learn to mimic sounds quite easily along with some words and phrases if you spend a lot of time with them. Not known to be loud, do not generally scream, but rather make low-key whistles, chirps, squeaks, and assorted chattering. Can be a good bird for well-behaved children if hand-fed from babies and lots of time is spent with them. This is Scooter the African Grey Parrot eating a lollipop, which he is very much enjoying! Conures—"Taz (top back) is the Green Cheek and Buster is the Jenday Conure (front)"
When a bird is cold it will puff out its feathers in an attempt to warm itself. It may also shiver and tuck its leg up into its feathers trying to warm it. A puffy or shaking bird can also be a sign of illness. Birds will also puff out for a second to straighten their feathers and sometimes puff as a sign of contentment. However if your bird is puffed and remains puffed most of the time the chances are it is either sick or cold. Pictured is a budgie parakeet who was cold. As soon as the AC was turned off and the vents closed the bird stopped puffing out. Budgie parakeets are very social birds. If you are not going to be able to spend most of your day with them you will need to have two birds. They will not be happy spending the days alone. Being alone is not natural for them and they will become sad, bored and depressed.